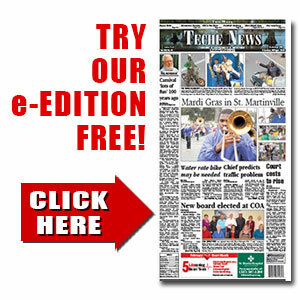 State | TecheToday.com | Teche News | St. Martinville, La. Community Foundation of Acadiana (CFA) has created the In the Line of Duty Fund in response to the tragic July 17 shooting of seven Baton Rouge Police Officers, of which three were killed. Donations to the fund are tax-deductible and 100 percent of all contributions will be given to those officers and their families. With a vote of the Town Council Monday, Henderson joined St. Martin Parish in asking the state to explore the question of mineral royalty payments in the Atchafalaya Basin. All retail Cleco customers will see lower energy bills beginning July 1, thanks to a one-time credit of approximately $475 per customer account. The Louisiana Public Service Commission (LPSC) ordered the credit as part of a set of commitments the new owners agreed upon to acquire the company.